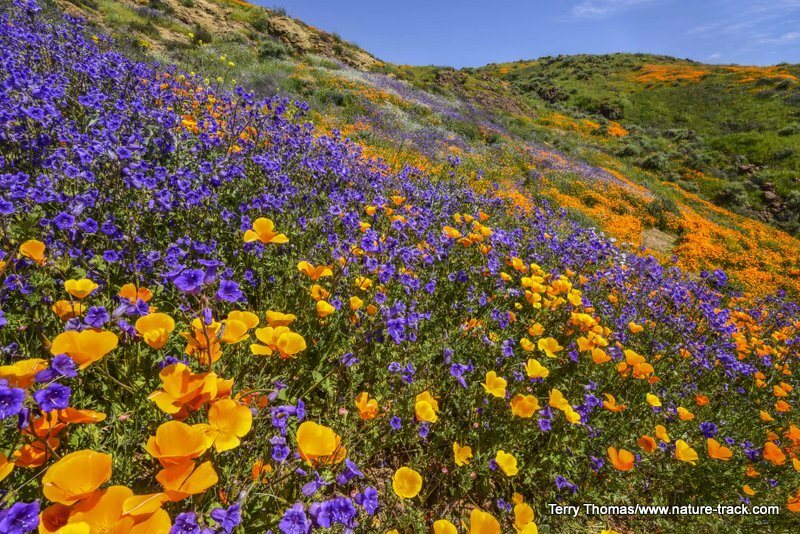 With all the rain this past winter in California and Arizona, expectations are high for a superbloom when wildflowers flower in an abundance seen only rarely. In places this is occurring while in other places it is business as usual. 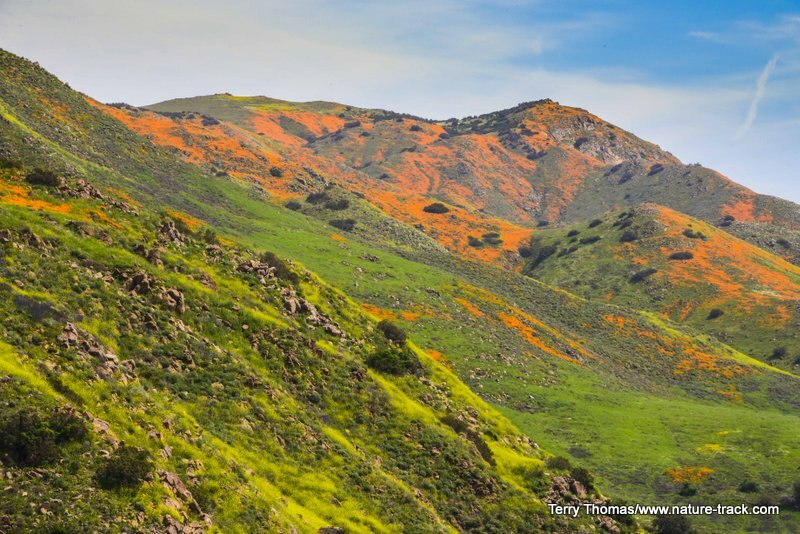 At Lake Elsinore, California, about 30 air miles east of Santa Barbara, the dream has come true in spades. 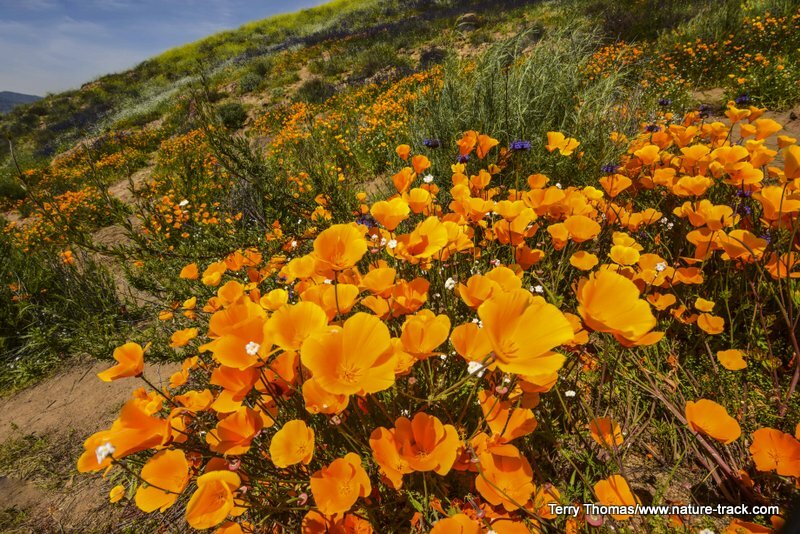 Hillsides along Interstate 15 on the north side are blanketed in an unbelievable carpet of orange California poppies. The effect is as visually stunning a natural spectacle as I have ever seen. 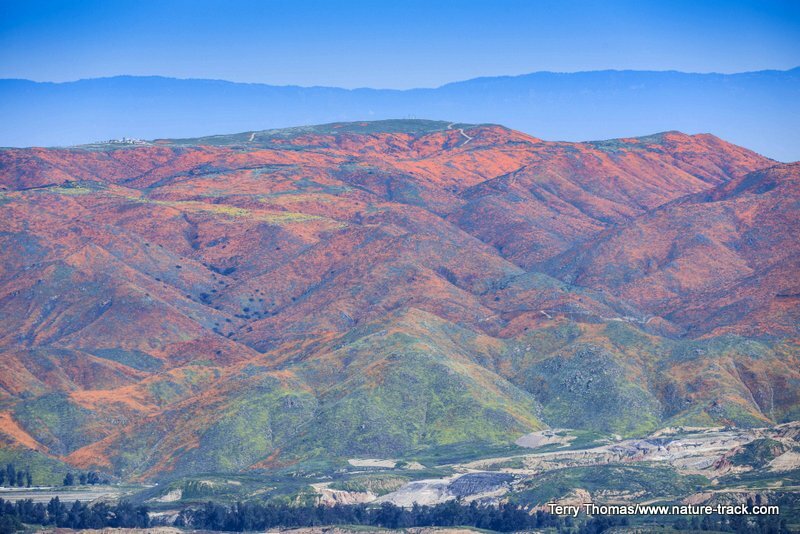 Entire hillsides are completely orange, dazzlingly so, almost to the point of requiring sunglasses to view them. 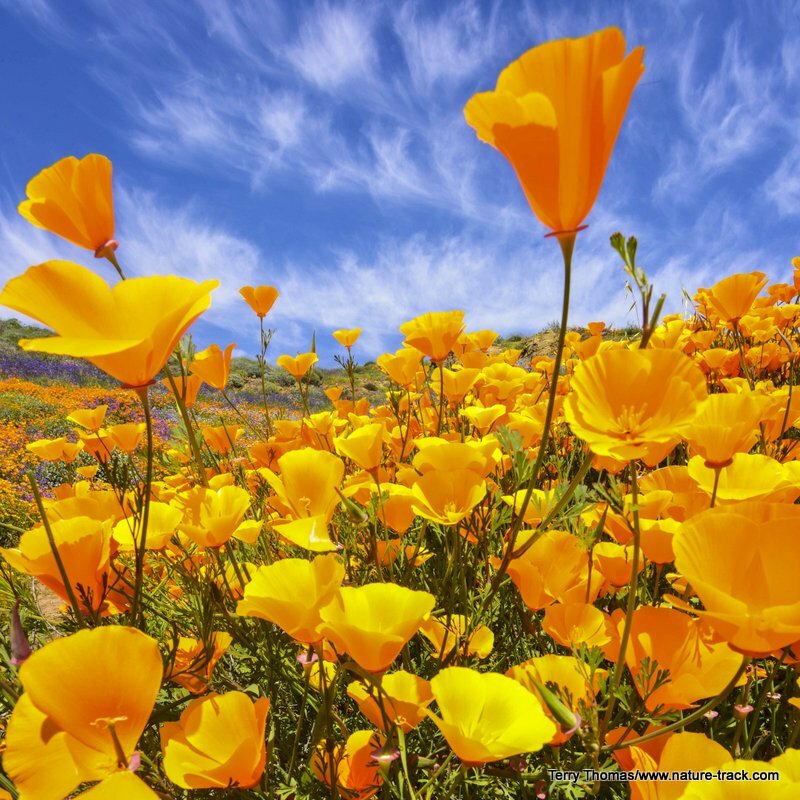 There are other flowers as well, perhaps several dozen species, and these serve to complement the poppies. 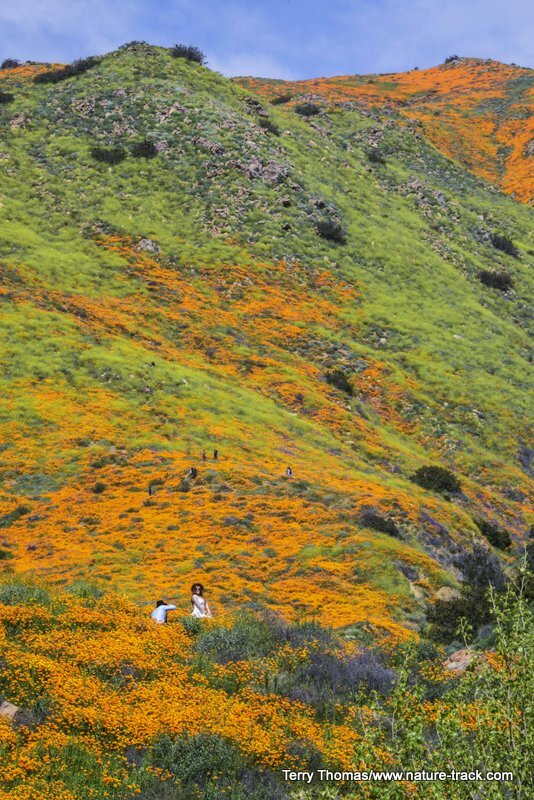 This superbloom even has locals talking. Many claim that they have never seen a bloom as impressive as this one. As word of the incredible sight has spread, visitors have flocked to Lake Elsinore. Normally a town of about 60,000, last weekend saw numbers swell to three times that. Such unexpected visitation has overwhelmed local services and forced the closure of several access points. 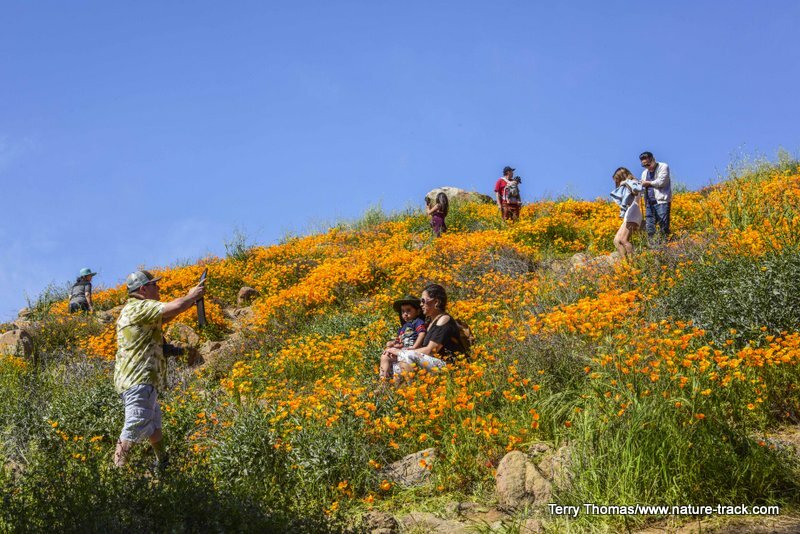 On March 19th we happened to be in Long Beach when we heard about this superbloom, we determined not to miss it and to become part of the problem if necessary, just to see it. We drove into Lake Elsinore across Highway 75, coming in from the west. 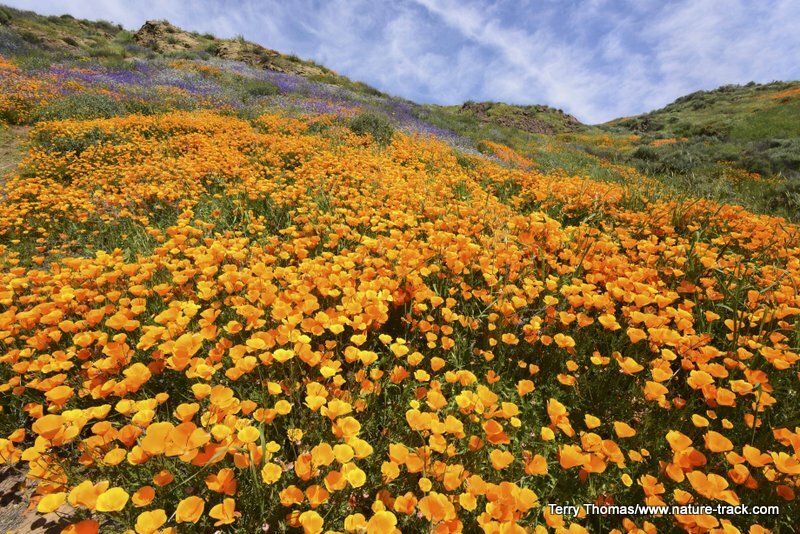 As soon as we rounded the last curve of the canyon, the sight of the poppies was breathtaking. We stopped at a pullout, likely breaking some ordinance or another, and took a few photos. Then we headed into town. There is one canyon road that can take you up on top of the hills but it was temporarily closed. People were parking up to a mile from the canyon and walking in. While this looked appealing, we took a chance on finding someplace a little less crowded. We drove northwest and crossed under the Interstate at Old Woman Trail Road. 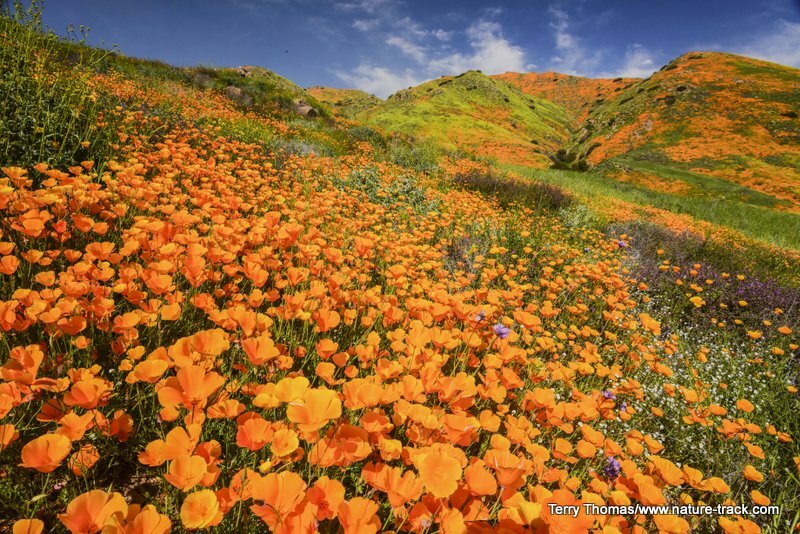 This area still had a lot of visitors, but we were able to find parking that was much closer to the poppies. The best area was opposite some construction where we could walk down a construction road for a short distance, cross the creek on a couple of logs and be immersed in poppies. While the poppy scenics were what I was there for, many photographers were there with clients or friends to gather portraits among the poppies. There may still be a week or two left of the poppy season and who knows, it might even get better. If you get the chance to go, it will be worth it.